LAS VEGAS, August 17, 2018 - Farm2Kitchen, a food traceability platform on Blockchain for the Food Service Delivery industry, is selected for the final round of Blockchain OSCAR hosted at the BlockShow annual conference in Las Vegas on Aug. 20 and 21. More than 100 startups applied for the BlockShow Oscar and Farm2Kitchen is one of the top 10 selected for the final round. BlockShow Oscar is a startup competition for young and innovative blockchain companies where carefully selected startups present their groundbreaking solutions. Previous BlockShow Oscar participants have raised more than $500 million in funding. It’s a great honor, recognition and opportunity for the Farm2Kitchen initiative, which is the brainchild of a highly proficient team of experts with a wealth of experience in Agriculture, Food Distribution and Technology industries. BlockShow Conference, a major international blockchain event powered by Cointelegraph, gathers the most exciting people in the industry and provide an opportunity to discover the hottest innovations and trends. This year’s BlockShow Americas has a strong line-up of over 100 speakers and contributors and is expected to be attended by a few thousand industry professionals and investors providing a vast networking opportunity. Farm2Kitchen is developing decentralized Food Service Delivery platform by utilizing the Blockchain technology of distributed ledger and smart contracts to precisely track every step of the food delivery on a shared ledger in order to ensure transparency, food Safety and provide the foundation for sustainable agricultural growth and food security. 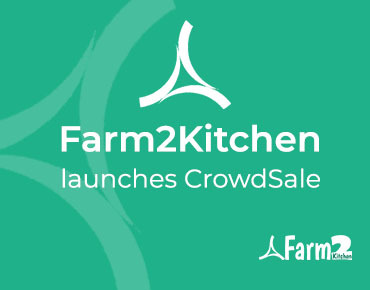 Farm2Kitchen is also developing the Web Portal, Mobile Apps and other tools to interface with the platform and these will be available on the public Cloud as a Software as a Service (SaaS) application on a subscription basis for the food supply chains participants to use around the world. Want to get some interesting updates from our team?